Besides the descriptive profile below, there is also a more detailed and factual resume. 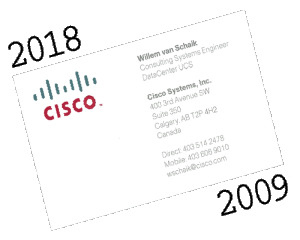 In late 2009, when Sun got bought, I got the opportunity to join Cisco. Not as a networking person, but as a pre-sales systems engineer for the brand new Unified Compute System (UCS). The years since then have been a blast. Starting with zero, growing UCS in six years to the World Wide market leader in X86 blades. With my background, my focus has always been on the application side of the house: SAP, HANA, Oracle, SCADA, Big Data, etc. And on-the-side building a UCS Rack Layout tool for which I received in 2015 the Innovation Award for the Americas. 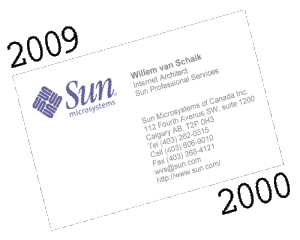 In 2000, I became an Internet Architect for Sun Professional Services. After many years with managerial roles, I went back into a technical position, which was refreshing. Working for Sun enabled me to do projects on the forefront of Internet technology. Like B2B marketplaces, security for financial transactions and web portals for HPC clusters. Halfway my nine years at Sun my role changed from post- to pre-sales and from software to hardware. As a national SE my area of expertise became virtualization and large scale server consolidation. 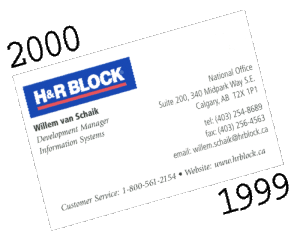 My start in Calgary, Canada was as a software development manager for H&R Block Canada. Leading a team of analysts and programmers we developed the applications needed for this tax preparation company. To improve the distribution of marketing information to the 600 offices we built an intranet linked to our datawarehouse. In a country of seven thousand km east to west this is definitely the way to go. 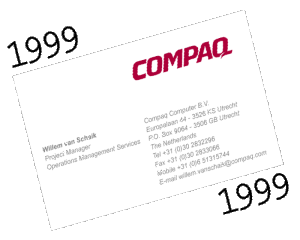 After having cycled for half a year, I worked for Compaq as a project manager for desktop management services. The project involved the analysis and design of a system management environment at the head-quarters, two production sites and an R&D department of a large multi-national. After our stay in Singapore, my wife Fiona and I took the opportunity to fulfill a long time dream. A long-distance bicycling journey through Europe. From the North Cape in Norway to Gibraltar in Spain. It led us through Norway, Denmark, Germany, France, Spain and Portugal. 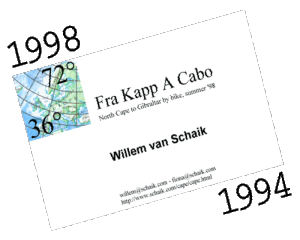 Under the name "Fra Kapp A Cabo", we needed four months to complete this 7200 km journey. It probably was what is called our "once in a life-time" experience. At moments very tough, at others very beautiful. 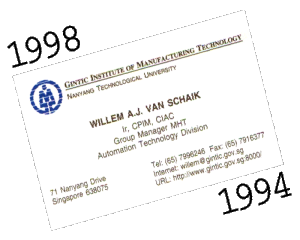 After 10 years Philips, I made a move to Singapore to work for Gintic, an Institute in Manufacturing Technology. I built-up and managed a fifteen people team specialized in manufacturing and third party logistics to support the Singapore industry. I was chairman editor of our company magazine "Cutting Edge" and I lectured part-time at a CIM Masters program with the Nanyang Technological University (NTU) on Shop Floor Control and Industrial Data Communication. 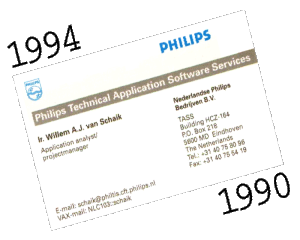 My next four years at Philips I worked on technical and industrial automation. In that period I was the team-lead of two major but very different projects. For the five km long CTE tunnel in Singapore, we designed and implemented a fully automated monitoring and control system. The system was based on Stratus' computers for the RT database, Sun's for the GUI and VME/PLC systems for local control. Software-wise the whole system was based on the FAST/Tools SCADA system. Next came a Shop Floor Control system for the first factory in Europe to mass-produce Flat Panel Display (LCD screens). Within a year the system was designed and implemented. Starting day one of production, the system was tracking all batches. This was followed by linking the system with 80 robots, using Secs I&II messages. During my period at TASS I got my APICS certification and extended my scope with International Management training and a course in "Marketing for Non-Marketeers". 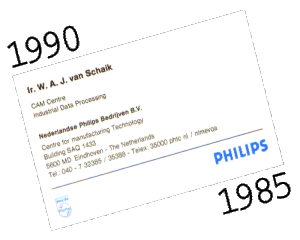 In 1985 I joined Philips' Centre for Manufacturing Technology in Eindhoven to be able to make the step from administrative to technical automation. Being part of the Industrial Data Processing group of the CFT's CAM centre, I worked in various functions on Shop Floor level Industrial Automation projects. My skills were enhanced both in technical and managerial sense. Training in software engineering, information analysis and business administration. 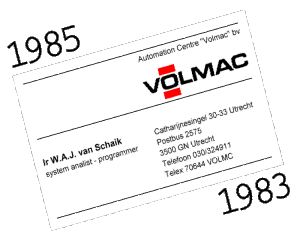 After a Masters in Architecture at the Delft University of Technology, I started my career at Volmac, at the time Holland's largest software house. Which later became part of Cap Gemini. My first assignment was at a bank, where I programmed in PL/1 on large IBM MVS systems. Later on I was assigned to IBM Research Labs in Uithoorn, to do a field-test of the (then brand new) QMF 4GL in combination with an SQL/DS database.